The engine id table is used to store known engine ids with corresponding hostadress and port. Definition at line 421 of file mp_v3.h. Add an entry to the table. Remove the given engine id from the table. Remove the entry for the given address/port from the table. Get the engine_id of the SNMP entity at the given host/port. 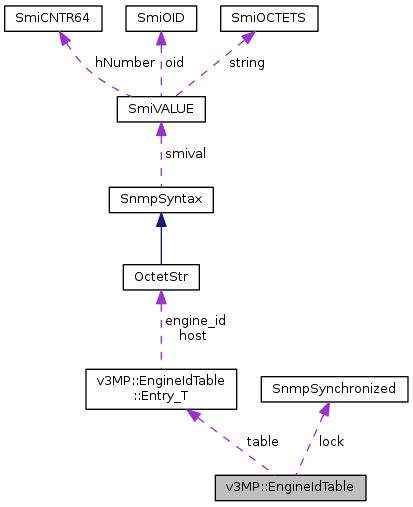 Get the engineID of the SNMP entity at the given host/port. Remove all entries from the engine id table. Definition at line 505 of file mp_v3.h. Definition at line 506 of file mp_v3.h. Definition at line 504 of file mp_v3.h. Definition at line 503 of file mp_v3.h.